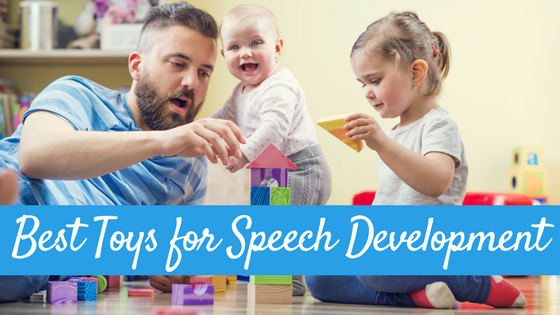 I am often asked as an SLP what types of toys and gifts I would recommend to help expand speech and language development in young children. If you have been a reader for a while, you probably already know that I am huge supporter of PLAY and the use of open ended toys as well as providing multi sensory learning and play experiences for our little ones. Yesterday, I shared my Tips for Selecting Quality Toys this Holiday Season and today I am sharing my list of gifts that I recommend for ANY child, but that I feel provide optimal opportunities for speech and language development for young children. So here we go! This post contains affiliate links to Amazon for your convenience. Gift images below are from Amazon.com unless otherwise specified. When it comes to babies, the most invaluable gift in terms of speech and language development is really YOU. Babies need PEOPLE interacting with them to learn language! Remember, babies start learning language the day they are born even they cannot yet speak. For this age group, we are wanting to work on forming strong bonds with our babies during play and exposing them to multi sensory experiences that provide them with opportunities to build cognitive skills and pre-verbal skills. 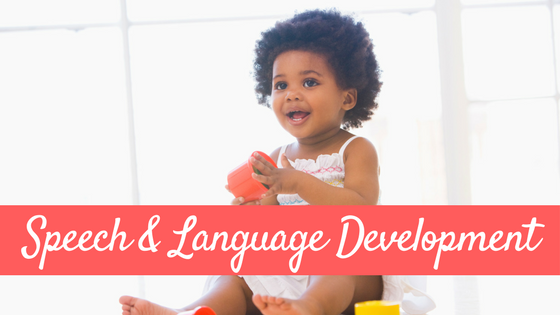 Check out my posts speech and language development birth to 6 months and speech and language development 6-12 months for more information on infant development. Here are some toys that can help to support your baby’s speech and language development as you PLAY with him/her. My three month old LOVES the mirror, and both of his siblings did as well. In fact, Emory is getting a new little mirror for Christmas this year as the one both my biggies used was damaged at some point. Why a mirror? Babies simply love looking at their reflection and when you pair the mirror with your commentary about what/who they see, you are providing your child with fun, social language while utilizing his many senses. When you look at the mirror then to your child and back to the mirror again, you are modeling joint attention, a crucial pre-verbal skill. In addition, the mirror can help provide opportinities for learning the important pre-verbal cognitive skill of object permanence that we discussed above. 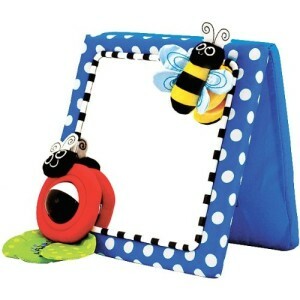 Emory is getting this Sassy Crib and Floor Mirror which is similar to the one my biggies loved. Not only are stacking cups great for motor and cognotive skills, they can also provide opportunities for speech and language development as you play with your baby. Remember when we talked about joint attention and object permanence above? Stacking cups are another great gift that can provide opportunities for learning these important cognitive skills. You can hide different fun toys, like small plastic animals, under the cups and play the “where is it?” game! This provides opportunities to build vocabulary, joint attention, object permanence, and overall bonding. And get this- my biggies are almost 5 and almost 3 and still love our stacking cups. These have been by FAR one of BEST and most versatile toys we have ever purchased. We have the Playgo My First Stacking Cups , pictured the the right. I provide tips for using these to expand speech and language skills in my Best Toy Series part one. object permanence. They also provide opportunities for learning concepts such as IN, OUT, ON, UNDER, NEXT TO and so on. If your little one also learns his shape vocabulary along the way, that is a BONUS! My two favorite shape sorters are the Fisher-Price Brilliant Basics Baby’s First Blocks and the Melissa & Doug Shape Sorting Cube , pictured below. I provide tips for using these to expand speech and language skills in my Best Toy Series part one. Songs and finger plays are fantastic for ALL ages, but since you can totally start singing and doing finger plays with your baby, I decided to put it here under the baby title. 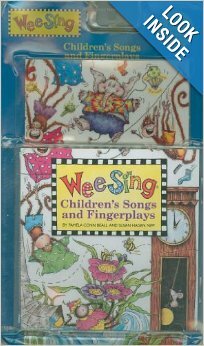 A great resource for learning simple songs and finger plays is the Wee Sing Children’s Songs and Fingerplays book and CD combo, pictured below. Hours of fun and SO many opportunities for language learning using your babies many senses. However, there are also so many FREE resources on the web to learn songs and finger plays as well including this great free book in PDF from District 196. As you’ve probably noticed, all the toys above can also be great gifts for toddlers. Toddlers and preschoolers love stacking cups, shape sorters and finger plays so keep those in mind as well. These next gifts are designed for toddlers and preschoolers: Children who are communicating with intent and are using (or on their way to) speech for communication. The toys that rely heavily on pretend play skills may be more appropriate for those age three and up however this really depends on your own child’s individual interests and developmental level. Wondering what language skills specific toys can target? Read each description as I provide this information or links to more information for all my recommendations. For more information on speech and language development in the first 5 years of life, check out my Speech & Language Development Birth to Five Series. Building toys are a HUGE thing in our home. Both my kids LOVE building. I love plain wooden blocks of different shapes and sizes like the ones below from Melissa & Doug . We are also HUGE LEGO DUPLO fans here. But building toys are not just limited to small world play. 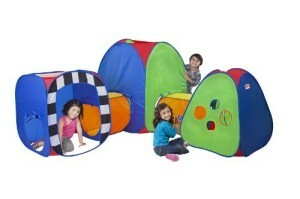 My kids LOVE the Little TikeStix Clubhouse where you can build your own fort (!) and this year my kids are finally getting a set of the Jumbo Cardboard Blocks by Melissa & Doug that I LOVED playing with when I was a kid! I provide tips for using these to expand speech and language skills in my Best Toy Series part one. My daughter received a tent and tunnel set for her first birthday that has been a huge hit. Not only are these sets fantastic for gross motor development, but they allow for so many opportunities for language as well! I like to use these sets as part of obstacle courses in our home. Going IN and OUT and UNDER and THROUGH is so much fun and is great for working on listening and following directions. Ours is similar to the Megaland one pictured below. I often see sets like these at Ross, Marshalls, TJ MAXX and Homegoods around the holidays for good deals. You can read my post all about obstacle courses for some ideas on using these for meaningful play and speech and language expansion. A big hit at our house is our ride on/in toys. We have some for indoor use and some for outdoor use. 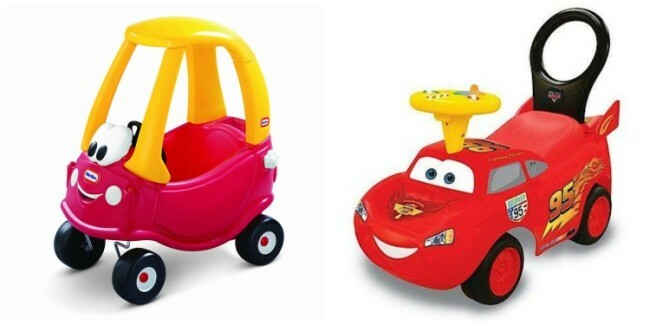 A favorite that we have had for many years is our Little Tikes Cozy Coupe . My little guy’s favorite is his Lightning McQueen Ride On toy that he rides all over our house. Ride on toys are great for gross motor development as well as speech and language. I provide tips for using these to expand speech and language skills in my Best Toys Series part four. Mr.Potato Head is a staple tool for us pediatric speech pathologists and I cover the many many ways you can use him to expand speech and language skills in my Best Toys Series part two. 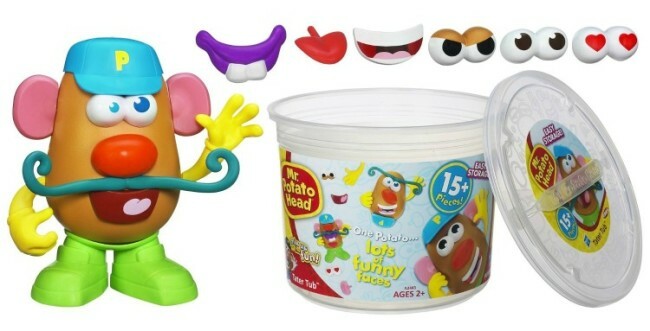 From body part ID to color ID to basic concepts Mr.Potato Head is a fantastic, versatile and fun toy! Another pediatric speech pathologist staple: The Farm Set. I personally love these two: TheMelissa & Doug Fold and Go Mini Barn and the Fisher-Price Little People Animal Sounds Farm . Both are great for building speech and language skills, which I cover in my Best Toys Series part two. We have the Fisher Price one below as well as a plethora of Little People Animals. Currently this is a huge favorite of my almost three year old son right now. Yup, another SLP staple here too! The doll house. Again, I like the Fisher-Price Little People Happy Sounds Home and the Melissa & Doug Fold & Go Dollhouse because they are both small and fold up for easy storage or portability. I provide tips for using these to expand speech and language skills in my Best Toys Series part three. The Doll House is by far one of my TOP recommendations of all time. One of my most utilized toys in therapy has been my Thomas the Train Set . Using my speech pathologist tricks of the trade, I am able to use this highly motivating toy to teach and elicit a great deal of language with my train-obsessed clients. In addition, I have used toy blocks to build entire cities, roads, and construction sites and used Town and Road Rugs to engage and teach language to children who are highly motivated by cars, trucks, and city toys. If your child is interested in this kind of play, these can be great toys for you! There are only about 543,876 different kinds of toy cars out there to choose from, ha! I suggest finding a type that your child is interested in that is appropriate for his/her developmental level. I personally like both the wooden and plastic train sets (I have plastic for work, wooden for my own kids), an inexpensive car mat (ours is from Ikea and pictured below) and a few simple toy cars. My son loves the CAT Construction Toys and Hot Wheels . I provide tips for using these to expand speech and language skills in my Best Toys Series part two. Kids love to play what they see. Both my kids have been known to pick up some tools and copy their daddy and mommy (hey, I can use a hammer too!). A simple tool set is great for hand-eye coordination, fine motor skills, and can provide opportunities for speech and language learning as well! We love the Theo Klein Bosch Tool Box With Ixolino and my son is getting a Black and Decker Small Workbench . I also found this cool Green Toys Tool Set in pink! Our kitchen set is one of our most used toys. My son loves cooking in “his kitchen” and bringing me food. Kitchen sets provide SO MANY opportunities for speech and language learning! I provide tips for using these to expand speech and language skills in my Best Toys Series part three. 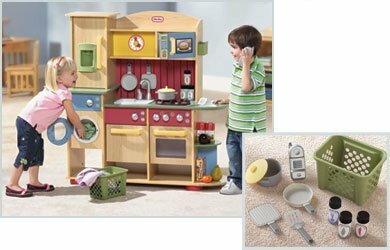 Both KidKraft and Little Tikes make several different types of toy kitchens for every budget. We have a Little Tikes one (pictured below). I firmly believe all kids should have at least one baby doll. Yes even boys. In fact, check out this post I contributed too all about the benefits of baby dolls on speech development on Mama OT. I also provide tips for using these to expand speech and language skills in my Best Toys Series part two. My kids LOVED their baby stroller (before it broke..we need a new one!) and my daughter uses her doll bed all the time! The doll below is by Melissa & Doug but like cars, there are thousands of dolls to choose from. I recommend plain dolls that do not require batteries (though I admit, we do have one doll that “eats” and cries and my daughter loves it). Like I said earlier, kids love to play what they see. Playing “store” is one activity most kids love to play and allow for so many communication opportunities! My kids have been eying the Learning Resources Teaching Cash Register below for months now at our local specialty toy store so that, along with a new Shopping Cart are on their Christmas lists this year. My kids already love to play “shopping” which provides LOADS of speech and language opportunities! Plus, it keeps them occupied for quite a while. Win-win! As far as play food, I personally love Melissa and Doug Food , like the set pictured below. (In fact, my kids LOVE the food you can cut . Awesome for motor development as well). Pretending to be different types of people is fun and allows for great opportunities to learn new vocabulary. Since my daughter goes to the doctor a lot doctor play is a common thing here! We personally love our Kidoozie Little Doctor Kit (pictured below) in this house. We also have a fun Vet Set the kids love and Super Hero Capes that get a LOT of use. I provide tips for using these to expand speech and language skills in my Best Toys Series part three. A great gift would be to gather some items for different “pretend play scenarios” which you can put out for your child or rotate several different sets, depending on their interests. Get outside and play! Playhouses are great for incorporating real-life play outside. We have one very similar to the Winchester Playhouse which we got from Costco for under $300 (ours pictured below). 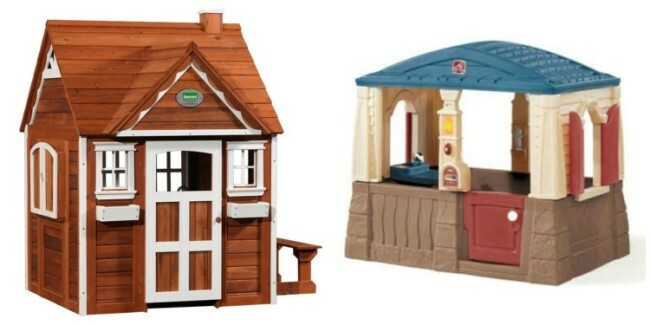 However there are many different types of playhouses you can get as well for good deals, like the Step2 Neat & Tidy Cottage pictured below. I am known to use lots of arts and crafts in my therapy sessions. They provide so many opportunities for speech and language learning and meaningful communication. I explain this in more detail and provide tips in my post about using Craft Activities to Expand & Stimulate Language Skills. Don’t worry, YOU do not have to be “crafty” to do some simple crafts with your children! 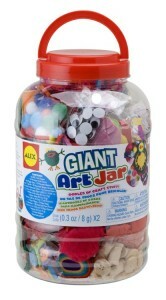 I love these Craft Giant Art Jar from ALEX® Toys. You can get similar sets at Michael’s or JoAnne’s as well. They basically give you a bunch of different craft materials that you can use to make whatever you want! Clueless on crafts? Check my favorite educational crafty bloggers: Kristina at Toddler Approved, Deborah at Teach Preschool, Jackie at Happy Hooligans, Sheryl at Teaching 2 & 3 Year Olds and and Allison at No Time for Flash Cards all provide AWESOME crafty ideas! We love play dough here! I provide tips for using these to expand speech and language skills in my Best Toys Series part four. Play dough is so great for speech and language, fine motor, problem solving skills and more. 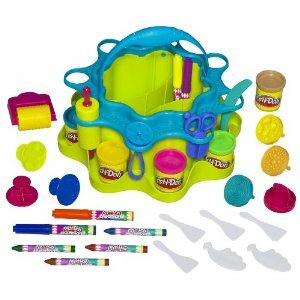 We LOVE this Play-Doh Creations Caddy that my parents got my kids a few years ago. It is super convenient to store and transport the fun! All children have their own individual personality and interests. Some children have an interest in princesses while others love pirates. This is where your child’s individuality really comes into play when selecting gifts for your child. For example, my son loves superheros, so we got him a superhero play set for his birthday (In January). 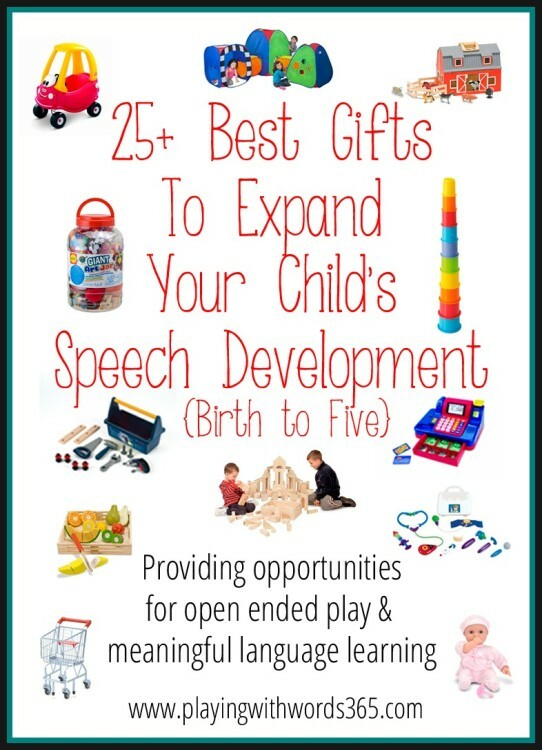 When thinking about gifts for your child that can expand his speech/language skills, think about what REALLY interests him. Highly motivating toys=more opportunities and motivation for language use. Combine his interests with my tips I shared yesterday to select fun and motivating gifts this season! Some examples: If your child loves princesses, she may be interested in the Fisher-Price Little People Disney Princess Songs Palace . Have a pirate lover? 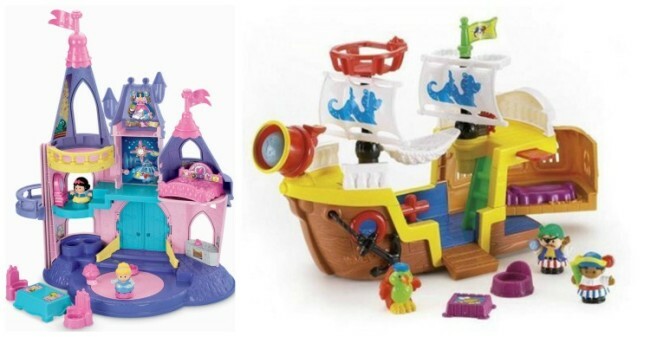 My son loves his Fisher-Price Little People Lil Pirate Ship , both pictured below. (Both come with batteries…you may want to remove them). 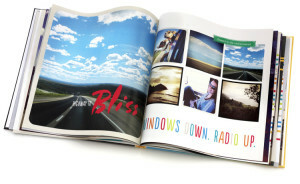 You can have a photo book made just about anywhere that prints pictures these days, though I have made most of mine through Shutterfly when they have a great money saving offer (as they always do during the holidays!). READING is one of the best ways to help promote speech and language development in all children. Check out one of my favorite blogs No Time for Flash Cards where she shares lists of great books for various age ranges and themes to get some ideas. Remember my tip? “Sometimes the best toys are not really toys?” Do not underestimate the power of a cardboard box! Your children can spend hours and hours playing with a simple cardboard box, allowing for tons of language learning opportunities. Even babies can have fun crawling IN and OUT of a box. So…keep those large boxes as they may end up being the best present of all! I offer up a lot of “things” I recommend in this post, because the holidays are known for gift-giving and when it come to kids, the most common gifts we give are “things”. However, an even better gift idea, especially for those children who may already have plenty of toys, is the gift of new experiences. You can gift your child/family memberships to your local zoo or children’s museums. You can gift your child a new class like music, movement, dance, or art. You can even get even more simple and gift your child a little coupon book full of simple new experiences you can do together that he/she can “cash in” once a month or something. Ideas could be nature hikes, trip to local museum, trip to the zoo, movie night, special 1:1 time with each parent for a day, etc. These new experiences allow for new vocabulary and language learning and the memories you make together are priceless. 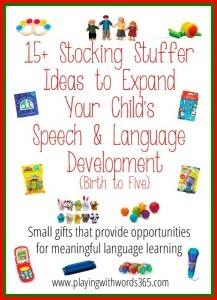 The best gift you can really give your child this holiday season to help their speech and language development is you. Your time, attention and dedication. Time to play. Time to talk. Time to laugh. Time to snuggle. Time to connect. Your laugh, your smile and your snuggles. Meaningful time with YOU. 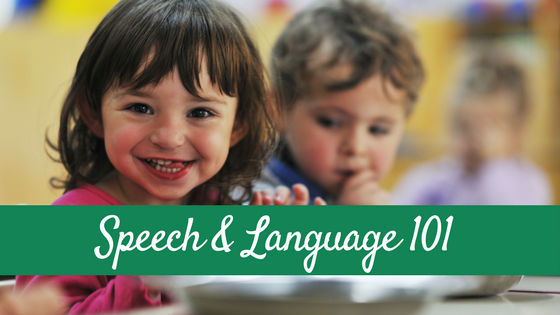 Children learn speech and language in everyday experiences and the more time you can spend with them the better. Your children need some time where you give them your undivided attention. I know this is NOT always easy, especially when you have multiple children and/or you work outside the home. 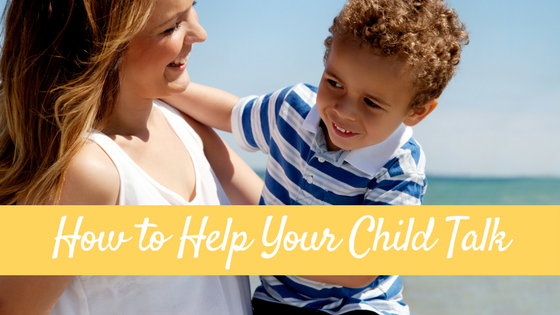 In these cases, you may need to schedule in some 1:1 time with each of your children. Believe me, it will not just be your children who benefit from this time! You will benefit as well. Being dedicated to helping them is also such an important gift that has no price tag. 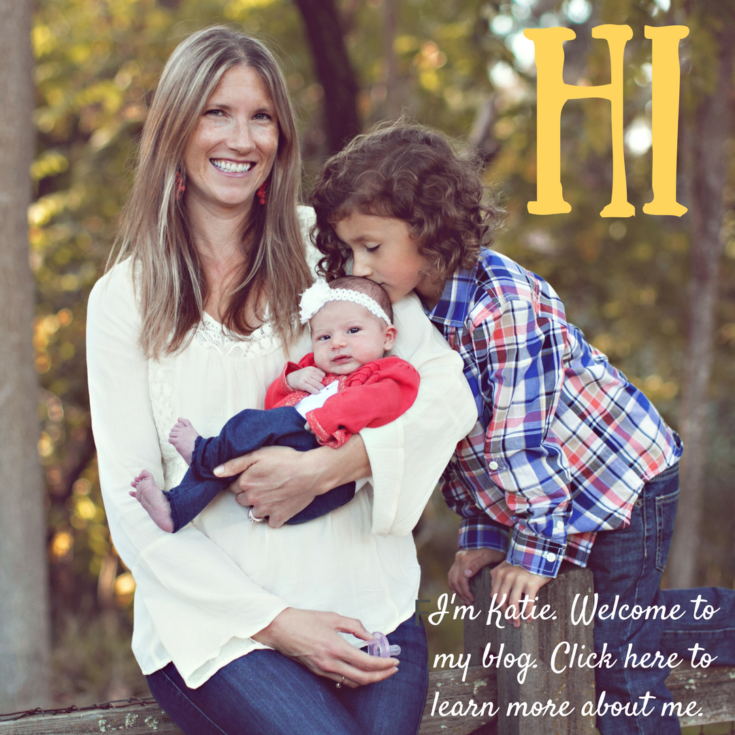 If your child is struggling with speech and language, and you are looking for more ways to help him/her, in addition to this site, you may also want to check out Little Stories and Teach Me To Talk, two other wonderful sites with fantastic information for parents. 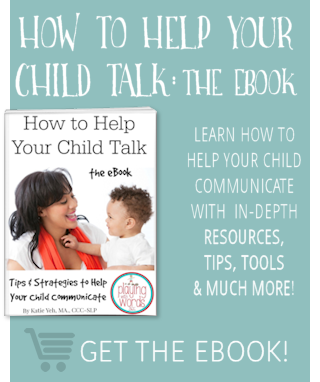 The two top books I recommend to parents of children with speech delays are My Toddler Talks: Strategies and Activities to Promote Your Child’s Language Development and It Takes Two To Talk: A Practical Guide For Parents of Children With Language Delays . So there you have it…my 25+ recommendations for gifts this holiday season. What would you add to this list? What are you planning to get YOUR child this season? Looking four MORE? Check out my other two posts below! 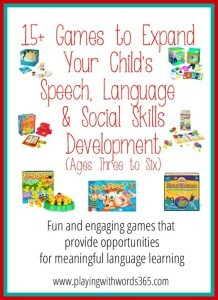 15+ Games and 15+ Stocking Stuffer Ideas to Expand Speech and Language skills in young children. Happy Shopping! This is a great list! My son has a speech delay (suspected childhood apraxia) and is in speech therapy. I work with it constantly with him at home and I saw a bunch of things that we have and play with that you have on your list that are great! One thing we don’t have yet that is on my list to get him for Christmas is a tunnel! He has sensory issues as well and recently started OT and she has been using a tunnel with him for that and he loves it so I definitely want to get one! Michelle @ The MaMade Diaries recently posted..Looking for a cute family Thanksgiving craft? Hi Michelle. Yes, tunnels are AWESOME! And since many children with CAS also have motor delays and/or sensory issues, tunnels and other gross motor toys can be really beneficial to their overall development. I bet he will love it! Fantastic list Katie! It’s great to see that we have a lot of these toys already (not so coincidentally they’re the ones that get the most use), but I’m so pleased to get some new ideas for the boys coming into Christmas. Loving your website. So many amazing resources. Thanks for sharing your knowledge so generously. Welcome Amy! So happy to hear my list has been helpful. Happy shopping! Hi Genie, I have never used those products so I cannot personally recommend them but thanks for letting us know! This is great, Katie! Pinned it. Thanks Julie! 🙂 Hope you find some goodies! This is an awesome list. Is there anyway to make this into a handout! We actually used it in a newsletter last year and gave you credit for it but we were hoping for a shortened version if possible…I wasn’t sure if anyone had made one they can send me. It’s a fantastic list and we use it in our December Newsletter. Thanks for your great share ,hope these toys could also work on my 3 year old speech development .